The Live From The Devil’s Triangle series turns twentyone with another spectacular line up of bands. As always, all the bands were recorded live in the KFJC pit. This years two CD set features performances by Sea Moss Remember Karen, Dire Wolves, Swimming in Bengal, Pet the Tiger, Grex, Cartoon Justice, Ackamoor Molina Duet, KREation Ensemble, The Orchardist, Ails, ColdClaw, Body Void, Meatslab, These Bastards, Yaawn, Morher, Kole Galbraith, Suki O’Kane and Kristian Olsson. Twentyone years sounds like a long time but it will fly by if you are listneing to great music. The best in live music will always come from the KFJC pit. Live From the Devil’s Triangle Vol XXI. 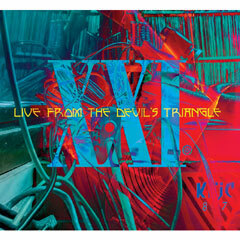 This 2XCD features live performances from great bands from around the world.